BLANTYRE, May 27 2016 (IPS) - It’s Saturday, market day at the popular Bvumbwe market in Thyolo district. About 40 kilometers away in Chiradzulu district, a vegetable vendor and mother of five, Esnart Nthawa, 35, has woken up at three a.m. to prepare for the journey to the market. The day before, she went about her village buying tomatoes and okra from farmers, which she has safely packed in her dengu (woven basket). Now she’s just waiting for a hired bicycle to take her and her merchandise to the bus station, where she will catch a minibus to Bvumbwe market. This way, her goods reach the market quicker and safer. Afterwards, she and her colleagues will pack their baskets and walk back home. “We walk for at least three hours…our bodies have just gotten used to it because we have no choice. If I don’t do this, then my children will suffer. As I am talking to you now, they are waiting for me to bring them food,” Nthawa told IPS. “I will buy a basin of maize there at the maize mill and have it processed into flour for nsima [a thick porridge that is Malawi’s staple food]. That’s the only meal they will eat today,” she said. Nthawa’s story resonates with many Malawians today. Almost half of the country’s population is facing hunger this year due to no or low harvests, resulting from the effects of El Nino which hit most parts of the southern and northern regions late last year. Minister of Agriculture, Irrigation and Water Development George Chaponda said in Parliament on May 25 that 8.4 million Malawians will be food insecure during the 2016/2017 season. His statement clearly contradicts President Peter Mutharika, who on Friday said in his State of the Nation Address that 2.8 million people faced hunger. The new high figure follows a World Food Programme Rapid assessment which said over eight million Malawians will be food insecure this year due to the effects of El Nino. Destructive floods in the north have compounded the country’s woes, causing the president to declare a state of emergency in April. With the drought also affecting Zimbabwe and other countries in southern Africa, an estimated 28 million people are now going hungry. In order to deal with the crisis, Agriculture Minister Chaponda says the government has “laid out a plan to import about one million metric tons of white maize to fill the food gap”. The authorities project that at least 1,290,000 metric tons of maize are needed to deal with the food crisis, out of which 790,000 metric tons will be distributed to those heavily affected by the drought starting from April 2016 to March 2017. The government also plans to intensify irrigation on commercial and smallholder farms, with an aim of increasing maize production at the national level. Officials say 18 million dollars is needed to carry out these measures. In the meantime, food prices continue to rise daily as the national currency, the Kwacha, continues to depreciate, forcing poor farming families to reduce their number of meals per day or sell their property in order to cope with the situation. A bag of maize which normally sells for seven dollars now costs 15 dollars. As usual, children have been hardest hit by the situation. The latest statistics on Severe Acute Malnutrition (SAM) show a 100 percent increase from December 2015 to January 2016, according to the United Nations Children’s Fund (UNICEF). UNICEF says it recorded more than 4,300 cases of severe malnutrition in the month of January alone this year, double the number recorded in December 2015. Dr. Queen Dube, a pediatrician at Queen Elizabeth Central Hospital in Blantyre – the main government referral hospital in southern Malawi – affirmed to IPS that there has been an increase in the number of malnutrition cases at the hospital. “At the moment, we have about 15 children admitted at our Nutrition Rehabilitation Unit…they have Marasmus, where they’re very thin or wasted, while others have Kwashiorkor, where the body is swollen. In other cases, the children have a combination of the two. These children suffer greatly from diarrheal diseases,” said Dube. She added that the hospital offers these children therapeutic feeding of special types of milk and chiponde (fortified peanut butter) for a determined period of time, until they pick up in weight and improve in general body appearance. “They are also given treatment for any underlying illness which they might have. Additionally, we also provide counseling to the mothers and guardians on proper nutrition so that when they get back home they can utilize the very little foods they have to prepare nutritious meals for their children,” she explained. Rights activists say it is high time the authorities started taking on board recommendations on how to make Malawi food secure made by independent groups such as the Malawi Vulnerability Assessment Committee-MVAC, which said 2.8 million people faced hunger in 2015. Chairperson of the Right to Food Network Billy Mayaya told IPS: “There’s too much politicisation and overreliance on maize as a crop for consumption. The government needs to use the data from MVAC as well as consider the Green Belt Initiative (GBI) and modalities to bring it to fruition. In his state of the nation address on May 20, President Mutharika said the Green Belt Initiative was still his government’s priority “in order to increase productivity of selected high value crops. “I am therefore pleased to report that construction of the irrigation infrastructure and the sugarcane factory in Salima district has been completed…the government has an ongoing Land Management Contract with Malawi Mangoes Limited where land has been provided for the production of bananas and mangoes,” he said. In addition, the president said the government plans to increase rice production for both consumption and export, as well as make the tobacco industry vibrant again. Malawi mainly relies on tobacco for its foreign exchange earnings. In February, President Mutharika made an international appeal for assistance, following which development partners including Britain and Japan provided over 35 million dollars. The government also obtained 80 million dollars from the World Bank for the Emergency Floods Recovery Project. The U.S. government has been the first to respond to the latest crisis, providing the Malawian government with 55 million dollars. 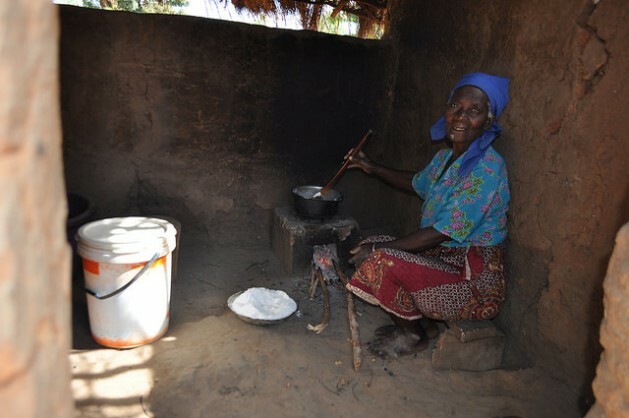 Meanwhile, the struggle for survival continues for poor Malawian families such as Esnart Nthawa’s. Her children are still eating one meal a day, as those in power continue to meet to strategize on the crisis over fancy dinners in expensive hotels.